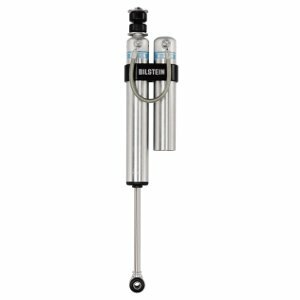 Bilstein 5160 remote reservoir shocks bring race technology to your truck in a bolt-on package. Bilstein 5160 remote reservoir shocks offer the ultimate in offroad shock technology in a shock that bolts into your stock mounting points and uses included brackets to make mounting the remote reservoir simple and easy. The Bilstein 5160 remote reservoir shocks come with detailed instructions for mounting the remote reservoir. No fabrication or modification is needed to install these offroad shocks. Bolt these on and go racing! Bilstein 5160 remote reservoir shocks use Bilsteins patented digressive valving to provide the very best handling and control immediately, no matter the conditions. The Bilstein 5160 line of shocks use a dividing piston located in the reservoir rather than the shock body to provide more movement for the shock piston and more wheel travel than traditional shocks with the dividing piston located in the shock body. Bilstein's monotube technology, combined with the remote oil reservoir work together to ensure that no matter what you put these Bilstein 5160 shocks through, they will perform beyond your expectations. If you want a shock that can bolt on to your truck and give you the performance of a full race shock, look no further than the Bilstein 5160 series. All Bilstein 5160 shocks include a reservoir mount. A Bilstein 5160 Billet Reservoir Clamp (pictured above) also available.